Before we begin, I would like to touch on a few things about suspension and its modification. I don't see suspension mods as ONLY for auto-cross or the 1/4 mile or even the race track. I see a well operating suspension as a way to improve the driving experience every time you get behind the wheel. If you go to the store for a 1/2 gallon of milk or over the hills and through the woods to grandmas house, you should enjoy your drive. If one installs a Kenne Bell or Whipple to get the rush of quick acceleration, does this mean that he/she romps on it at every stop light? Anyone that is running 350+ HP can "feel" the energy and power under the hood and most of the time, it's enough just knowing it is there. I see a nice suspension in the exact same way. I don't rip around every corner and push the limits of man and machine everytime I head out. But... I have the ability to take a nice corner and "feel" that my car and I are capable of soo much more and that, my friends, is enough most of the time. Now... down to bidness! I would like to state that this is NOT a completely original post. I have received permission from the orginal author to copy/paste his information into this thread. I have contributed very large portions of information, so would be safe to say I am a co-author and would appreciate any/all input to its accuracy and completeness. The information in this post has been gathered from many peoples questions/input over the course of several years and compiled here for convenience. Furthermore, this post deals specifically with geometry issues as they pertain to function of the suspension components as they work together in a general manner. Issues of roll center and roll axis are effected with some of these modifications and are beyond the scope of this post, so therefore, not addressed. What is the ULTIMATE goal for your ride? Before we get started here, I would like to mention two things that are VERY important for those considering modifications found within this thread. The first being that suspension can be quite difficult to do efficiently, as one often ends up replacing parts that were thought to be great and only to find out later needs have changed or the decision was a bad one. A real good example of this is the common purchase of aftermarket lower control arms (LCA's). This is great, but depending on the design, additional problems can arrise due to how they interact with other components within your suspensions travel. I have much information explaining the differences between designs so that one can better understand how your car will respond to such modifications. Secondly, with maybe one or two exceptions, the modifications listed here will create addtional Noise Vibration Harshness (NVH) to your driving experience. There is really no way to build a Mustang that eats corners for breakfast and rides like it's just off the showroom floor. That being said, one does not have to use earplugs to drive a corner-killer, just turn the stereo up a bit louder to overcome it! If you would like a car that will hold its own with a higher-end BMW or Corvette... you will need to spend some money for coil-over shock (CO's) with serious modification to the rear axle geometry to compete. This means, your OEM located springs are no longer needed and your existing shocks and struts will very likely need to be replaced. This info is really focused on the Fox Body ('79~'93) and SN95 ('94~'04) Mustangs. Much of this information is relative to the '05+ models (S197), but does not apply in some cases. The '99~'04 Cobra is also an exception, to some degree, as it is has independent rear suspension (IRS). The Mustang suspension: The Mustang suspension was poorly designed for high performance driving, therefore is good, but not great. The 4-link design that was incorporated in to the rear suspension between '79~'04 ('99~'04 Cobras excepted). It uses two lower control arms (LCA's) and two oddly angled upper control arms (UCA's) to position the axle side to side, prevent axle wind up and transfer force from the wheels to the chassis. Axle articulation is the main issue with the 4-link and leads to geometry problems in addressing the bumps and ruts of your everyday street. Axle articulation is seen when one wheel is up inside the wheel well and the other is down and out of the wheel well. This happens most aggressively when going up a steep incline at an angle and, to a lesser degree, upon body roll when turning sharply at higher speeds around a corner. The front suspension is not much better, but does not introduce such bind. With a flimsy sheet metal "K" member (or craddle) that weighs double what tubular parts do, it offers half the rigidity and prevents easy access to just about everything. The strut design also leaves something to be desired with caster/camber needing to be carefully monitored and tweaked to optimize handling. The modified Macpherson strut is the design of putting the spring about half of the distance from the pivot point on the "K" member to the ball joint at the spindles, while the strut being placed on the spindle it self. This leads to a slow and clumsy wheel rate (the speed the wheel reacts to changes in the road) and a poor ride. You can’t get good handling without punishing your low back. The body is also flimsy and allows for huge chassis twist and rebound. But HOLD ON!, it may sound like you are screwed, but your not. In fact, you are actually in a pretty good place. The Mustang, once fixed and a very good start for $2K, will begin to out handle just about any car around and includes Ferrari’s. Chassis Rigidity: The first thing you need to fix for your safety and any kind of racing is the chassis rigidity. Poor chassis rigidity leads to poor weight transfer, sloppy handling and poor ride. Not to mention the inability to take advantage of any mods that affect the movement of your car. Think about it... that’s everything! (see overall stiffness below) Solution: Subframe connectors and/or a roll cage. A good set of subframe connectors (SFC's) will connect the front and rear suspension to form a strong and continuous steel subframe, kind of like every other good car in the world. You can also do a cage, which will work better, but not required for your average Joe. I recommend any good companies kit, such as Maximum Motorsports, Griggs, even Steeda makes a decent set. They are welded to either end of your cars subframe and limit the flex across the length of your cars body. Not only does it make your car safer, it will help to keep your car doors keep from getting out of alignment after a couple years of hard driving. For less than $200, I believe this is the single most sugnificant mod and the beginning of a much improved suspension system. The SN95 is much improved over the Fox Body and the S197 is gererally accepted to not need any subframe uprades at all. The Macpherson strut: The true Macpherson strut is what you would normally see on a car. The shock is inside the spring. This links the recoil and spring rate together. It also means that you can place a smaller spring a lot closer to the wheel, giving you a better wheel rate and a smoother ride and all the while reducing weight. A coilover, is simply a Macpherson strut that allows you to adjust the height of the spring and allowing you to adjust the ride height of your car to the application. In the case of our cars, converting to coil-overs actually means you get a better designed suspension component and adjustability. This, my friends, is a Double Wammy! I recommend coil-overs all around if within your budget and require no more modification than the parts them selves. Coil-overs: This is a shock or strut with a coil spring encircling it (CO's) and will require the use of caster/camber plates (see CC plates). The shock/strut and spring are installed as a complete assembly and able to replace either independent of each other. This provides for optimal damping without torsional loads while using lower spring rates for nicer ride and improved handling (see wheel rate). CO's are infinitely adjustable for ride height using a simple threaded spring perch located at bottom of the spring. Stiffness can be modified by use of a replacement spring, but needs to be paired properly with the shock or strut (see matching springs/shocks). Please note, that not ALL shocks/struts can be used in a CO application! Overall Stiffness - This, I will use to define the stiffness of your car as a whole. This is what your are adding by getting subframe connectors (see chassis rigidity above). You are tying the front and rear of the car together better. This makes all parts work together to attain a specific goal. The ultimate solution to this is a 10 point roll Cage. A 10 point roll cage is a cage that attaches the strut towers and rear shock towers to the central cage. A 6 point cage would be the central cage. It helps in stiffness a bit, but is mostly for safety. A 10 point stiffens the entire car. Front Stiffness - The stiffer your car is, the better it will handle... if the roads were always smooth as glass. The problem is, if you stiffen the front of your car a whole bunch, it won't adhere to the road as well due to poor conditions of most streets. This means you won't absorb those potholes and your car won't lean as much, but is even more problematic if not balanced to rear suspension. When the rear end is not as stiff, the car will tend to understeer. This is when your front end will slide out before your rear end does in a hard corner and does not follow steering input. Rear Stiffness - Your Rear stiffness works exactly like the front does. The stiffer it is the more the rear end will slide when upset by poor road conditions. When matched to the front, it will handle better, but when out of balance, you will have a hell of a time in corners. If you ever watch drift cars, you will notice the front end seems to be almost soft, it seems to glide a little more, absorbs the bumps. This gives them superior traction over the rear (see oversteer). The rear end, is SUPER STIFF as it is tied down as tight as they can be. This makes the car have excellent front end traction and a rear end that feels like its constantly on ice. There is no play for the suspension to absorb the bumps and shifts of the road the rear wheels receive every bit of the energy. It's like taking the clutch out of the transmission, but for your tires. They are either not going, or they are going 2000 RPM. Essentially, getting a drift car to peel out takes as much effort as it does to turn your car on. Overall stiffness is the most important aspect of your car once you have gotten the power and suspension bugs figured out. When your front and rear are equally stiff, or at least set up to work together, your car will be a whole new machine. But... if done incorrectly, you will think your car will be worthless if not dangerous. Shocks: They are an important part of buying aftermarket springs or going coil-overs. As with traditional springs, shocks should be matched to the rate, but high quality coil-overs will be customized to your shocks. There are many choices for shocks and many are specific to certain applications. Regardless, do NOT buy suspension components from an exhaust company. The shocks you get also has just as much to do with your ride quality as the springs. Your shocks are what keep the spring from bouncing after absorbing a shock. This means that you can over or under dampen your springs very easily. If you buy some amazing springs and keep your stock struts/shocks, you will hate life. The springs will overpower your shocks and you will spend all day bouncing down the road. Good companies for shocks/struts are harder to find and they cost more money. As mentioned above, you should always get new shocks/struts to match your springs. Although the budget minded modder might do otherwise. Most aftermarket springs are not a ton different in spring rate than your stock springs. Making it possible to swap them out without hugely affecting your shocks/springs and handling. Lower than about 2" of drop or a good 30% softer or harder spring rate and you should definitely be buying new shocks. The OEM shocks on your car will not be able to support the new limits of the travel for long with that much drop. Your suspension geometry will also be greately affected by that much of a drop without several other supporting mods. I will break it down for you in a few different ways. I don’t recommend adjustables unless you truly plan to adjust them a lot. Drag adustable – Tokico Illuminas, best adjustable drag shock out there. Its been proven many times. Road course adjustable – Starting with Konis, Penskes, Ohlins and Tokico D spec, are best adjustable shocks/struts out there and not horribly expensive either. Road course non-adjustable - Bilstein HD’s, and Bilstein custom valved from Maximum Motorports for coil-overs. 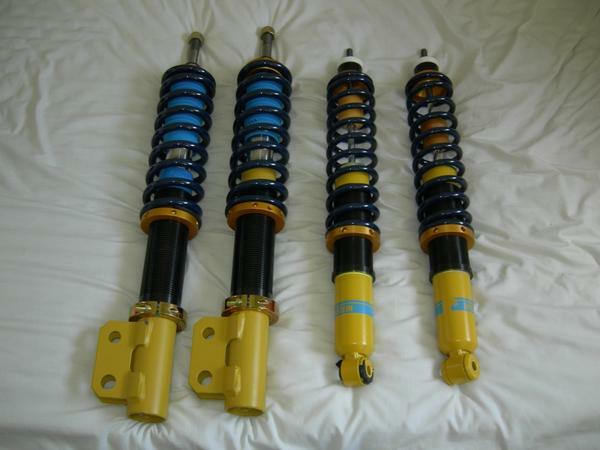 Also Koni Yellows are amazing shocks, but expensive and require very good springs. Cheap shocks - There are lots of cheap ones out there. Tokico HD’s and KYB’s are OK if you want a stock replacement. Not generally that great for high performance though. Matching springs/shocks: The job of a shock is to dampen the movement of the suspension or the springs. If you had no shocks, the car would just bounce around like a spring. Most shocks have a range of movement so think about an air pump, like you used for a bike tire. The harder/faster you push on it, the more resistance. Vice versa, the slower/easier/less you pushed on it, the least resistance is given. This is how a shock thinks or knows the difference between a bump in the road and you taking a corner at 120 mph. More importanly, you swerving suddenly because someone cut you off or a dog ran out in front of you. When you have over-compressed that shock all times, it's out of its normal stroke range. When you hit a bump, it responds as if the bump is larger, so it's tighter then what it should be. This causes the shock to wear out faster as it's always working hard... even under normal conditions! You feel bumps more then you would otherwise and this makes for a worse ride then need be. Handling wise, the shock was setup for a certain spring rate. It's set-up, in some cases with gas pressure, to address a specific amount of force or energy from the spring to dampen this movement and help with controling the car. Now you have a stiffer spring, basically a stronger spring pushing on the shock, its not setup for that spring, so it doesn't dampen the movement of the spring and the car is more easily "upset" by bumps and the handling is poor. Either way, the spring and shock should be "tuned" to work together for optimum ride/handling. 4 Link explained further: Your stock Mustang comes with a brilliant design called the 4 link. I explained its flaws above and oft referred to as the "quadra-bind" rear suspension. The real fix is a package kind of thing, as there are too many jobs that the 4 link is trying to do. If you're not going to modify your suspension all at once, the rear is much more important to modify than the front; the front may be bad, but the rear is horrible. Maximum Motorsports measured 2" of lateral axle travel with stock suspension. That's the wiggle you feel in the rear end under hard braking coming into a corner. There are other options than the torque arm mentioned above, including but not limited to the decoupled torque arm, tri-link, and 5-link. The torque arm is the most used by road racers, but it does have it's detractions. For one, it's heavier than some of the other options, and for two it sacrifices braking stability for stability under acceleration. These are hard on torque-boxes and detrimental to performance cornering of your ride. Made of round or squared tubular chromoly or aluminum, they have a polyeurothane bushing at each end. Such an arm offers less "give" than OEM arms found on the Mustang. They lessen the likelyhood of wheel hop and can allow the removal of the quad-shock found on '79~'04 rides. The quad-shock is in small part a contributer to rear end suspension geometry issues on the Mustang 4 link, so its removal can be of some benefit. The above design is also available in an adjustable length, although not as common. Those can be used to "fine tune" the axle center to help make room for larger drag tires and possibly avoid some rubbing. There are also disadvantages to the above design when it comes to road noise. Noise Vibration Harshness (NVH) is a trade-off for suspension upgrades and the above arms will add some. The bushings and arm itself is much less compliant than the OEM one, so additional sound will be heard inside your car. I cannot tell you exactly how much NVH you'll get, but WILL get some. You will get a bit more with the following types of arms, but much improved oporation of your rear suspension. 4. TeamZ: ('99~'04) Preferred* ~ adjustable No sway-bar mount VERY strong, DD and 1/4 mile with DR's ~ LOTS of NVH. *I prefer that if an LCA have a non-spherical bearing, it be on the axle end. This will create more NVH than the reverse, but I happen to like the relationship between an OEM type rear sway-bar and plate in which it mounts. < HORRIBLE DESIGN & NEVER RECOMMEND... EVER!!!!!!!!!!!! This design should NEVER be used in the desire to gain better handling of your ride! They are completely inflexable and greatly increase the suspension bind already inherant in the Mustang 4 link rear suspension. They are generally a solid arm and not even adjustable for pinion angle, so less than ideal for even a 1/4 mile ONLY application as well. There are adjustable poly UCA's if one does NOT DAILY DRIVE HIS/HER RIDE, but only wants the ability to address pinion angle. Short of going Panhard bar or Watts link (see below) this is another location I like to see a spherical end (see below for further details, if considering aftermarket UCA's). This end has been "pryed" open via articulation of the rear axle on a DD ride. This is due to arm having NO GIVE with only a little between the poly and OEM rubber bushings. It was forced open and eventually destroyed them, due to the normal events of the DD car. If the arms do not break... the mounting connections of your ride will. UNLESS YOU LIKE THE UCA ABOVE... DO NOT USE POLY BOXED ARMS ON YOUR RIDE! Like the LCA's above, these UCA's have a spherical (Heim jointed) end. This "eyeball" socket allows the arm to rotate multiple directions simultaneously. Combined with the poly/spherical LCA's above, this is a major relief to the rear axle bind of the 4 link*. For the next step in solid rear axle (SRA) cornering performance, one must forgo the UCA's altogether and can go with a Panhard bar or Watts link and torque-arm. There are also some other designs, such as the tri-link or 5 link conversion, but will not get into those here. *Even though this is a major improvement for freedom of rear axle, it is my understanding that such a UCA can allow undesired movement at extreme end of axle articulation. For this reason, I recommend that one invest the $$$ to go PHB or WL with TA for improved performance in ALL aspects of your ride. This will greatly improve the function of your rear suspension under hard cornering and MAJOR improvement in your roll-axis (RA) Oops..... I said I wasn't going to talk about roll-axis, my bad! *WL or PHB with TA = THE 4-LINK... SAVED! The Panhard Bar (PHB) or Watts Link (WL) are two items designed to take over one job of the 4 link. They bolt to your frame and connect to your axle with either a single pivoting bar or 2 bars connected to your differential housing. They both align the axle with the middle of your car. This prevent the rear axle from ever moving out of alignment and eliminates side to side axle bind. This means you can drift or turn hard without having to worry about the rear end skipping off the road and ruining your traction. When both the PHB or WL along with torque-arm (TA) are installed, you will lower what is known as the roll center to improve roll axis and is a good thing. Again, as mentioned at top of this page, we will not be getting into this specifically, but can research the subject if you like Google roll center. The '05+ (S197) models have a factory Panhard bar and control arm installed. This control arm is an improvement over the UCA's in the previous 4 link design, but does not offer the geometry improvements of a good torque arm. Torque Arm: A torque-arm (TA) is a piece that takes away the second job of the 4 link. It bolts to the housing of your differential preventing axle wind up entirely. It also runs parallel to your driveshaft and is welded to your subframe connectors via cross-member. If you install it and the panhard bar or Watts link, you can remove your upper control arms completely. This will save you a decent chunk of weight and give you a stiffer yet a more freely moving suspension along with improved roll axis. This leads to better wheel rates and solid transfer of energy to the wheels and chassis. Torque arms not only increase the ability to turn and accelerate, it also moves the connection point of the rear wheels to the body, making your car actually stop faster too. Instead of causing the car to dive as much, it keeps the car more level allowing your rear tires to do more of the work than stock. Bump steer: This is the tendency of a wheel to steer the car as it moves upwards over a bump and can be an issue when a car is lowered. This doesn't seem to come in to play until you have a 1.5"~2" drop. With a 1.5" drop, however, this is only noticeable in pretty extreme suspension travel. Something one would be close to upon bottoming out the front suspension. Below is a drawing illustrating the use and purpose of the bump steer kit. The red lines represent the steering rack (center of each image) and tie-rod ends (connecting to each wheel). This assembly operates best when all three parts are in the same line and best to be in this position driving down the street. The first is the stock set up and the second one is lowered. As you can see, the "A" arms and end-links are already at an angle. When you go over a bump, you will force them even more verticle, this will max out their range, and the car's front tires will toe inwards. Meaning, they will both turn in towards the car, if you happen to be turning at this time, you will lose the ability to turn at least one of the tires. The final picture is a lowered car with the bumpsteer kit. The kit as you can see is blue, and corrects the angle, putting the end links, back in parallel with the road, giving you desireable handling again. Wheel Rate: The force it takes for your tire to move up and down. This means how quickly your tire will move into the bumps on the road. You calculate it by the spring rate multiplied by the leverage. In the case of your stock front suspension. Your spring is roughly 1/3 - 1/4 of the way from the pivot point to the wheel. This means you have a 1/3 to 1/4 mechanical advantage on your wheel. For example: With 800 lbs/in springs, the wheel rate is closer to 200-250 lbs/in. and my force on the bottom of my car is closer to 2/3 - 3/4 advantage. Meaning I feel 3/4 of the bump, and have 1/4 the wheel reaction time it could. This is the main reason coil-overs (CO's) are so much lower in spring rate. A 300 lbs spring will get 90% of its force on the tire and the same amount on the car. This means you will feel roughly half the force on the car and gain 50% more force on the wheel. This leads to better handling and more comfortable ride. There is no real downside to going CO's up front other than cost. "K" Member / "A" arms: Your "K" member is the most important part of your front suspension. It is to which your engine, struts, "A" arms and sub-frame all connect. Your only choice, asside from OEM, is a tubular set up and usually requires tubular "A" arms and upgrade to coil-overs as well. The stock "A" arms can be used, in some cases, but are flexable and introduce some torsion issues between the mounting point, spring itself and strut. The stock "A" arms are also much heavier than tube ones and offer limited access for working on your car. For this reason, I recommend one goes all out at this point to get the most of the tube "K" upgrade. This can be a large change and a nice chunk of cash all at once, but definitely worth it. A new "K" member will give you improved suspension geometry and leads to better corner loading. It also adds stiffness to the front end with improved clearance for engine maintenance and the installation of turbo’s and upgrades to exhaust. It is a big mod and takes some time, but a worth while one in the end. Camber: Camber is the angle of the tire leaning inward toward the chassis (negative) or outward away from the chassis (positive). To get the most grip, you want the tire as flat against the pavement as possible as this gives you the largest contact patch. However, most suspension geometry doesn't keep the tire flat at all points of suspension travel, so you have to pick where in that travel you want the tire to be flat. Your typical A -> B driver wants that at straightline, as this gives the best braking. A corner-carver needs that extra grip when there's a bit of body roll (i.e. mid-corner), so they will lean the tire in so that it becomes flat against the pavement when it's the outside tire in a corner. Camber is going to be the most variable setup, as there is no static ideal - the ideal is going to be different for every different car on every different corner. Caster: Caster is the angle of the axis about which the tires steer. By increasing the amount of caster (leaning the top of that axis rearward), you increase straightline stability at the cost of steering angle and steering responsiveness. HOWEVER, with a McPherson strut setup you lose negative camber under compression (a very bad thing); a large amount of caster can be used to fake in dynamic camber gain (SLA suspensions naturally have dynamic camber gain, which is why Miatas and Civics hand a stock Mustang it's *** in the corners). Toe: angle of steering already dialed into the tire. If you look at just one side, toe in has the tire angle slightly "behind" where the steering wheel is pointed when you're turning the steering wheel into a turn on that side, and and slightly "ahead" of the steering wheel when you're going back to center. With both tires this way, it causes the car to "want" to be going straight, and resist going into turns, which is why factory alignment settings have a little toe in. Toe out will give you the opposite effect; the car will "want" to turn, but will resist straightening out the wheel. That's why qualifying setups for road track cars and autocrossers will generally run a hair bit of toe out; it sacrafices some straight line stability for better turn-in. Caster/camber plates: CC plates locate the top of your strut and allow for the adjustment of your caster and camber to a further degree than stock ones. These plates improve strength to the strut tower along with added adjustability to your car's alignment. They are required for most coil-over conversion kits as this added strength is needed due to relocation of springs. Caster/camber bolts: These are a replacement bolt installed on upper of the two front strut mounts with one installed on each side of the car. They have a "cammed" middle portion that is rotated to dial-in/out the amount of camber for your wheels. They are good for approx. 1° +/- of adjustment, so if your have more than about a 1" drop, you will probably not be able to attain OEM specs on camber without CC plates. < I HAVE HEARD SOME NEGATIVE STORIES REGARDING THESE AND POSSIBLITY OF BREAKING FROM SOME RESEARCH! Spring isolators: These are rubber or polyurethane bushings that sit on each end of the springs. The OEM ones are generally considered to be soft and reduce cornering response (very little effect on both counts). The isolators (ISOS) help to reduce road noise (NVH) and also rubbing of the springs on the perch. Long term, this could lead to wear on the perch and the spring, but ran my '85 GT for 20 years without them and had no issues of damage. I had installed a coating of heavy axle grease on each end of springs had no squeeking or rubbing noises. They do offer a small buffer or merge zone between the relatively motionless chassis and the expanding and contracting of the spring. Some people remove them in an attempt to get a slightly farther drop. This can reduce your ride hight by an additional 1/4"~3/4" depending on front or rear and geometry of your suspension components. However, considering the cost and the availability of lowering spings, I would say choose the right spring and change the isolators to aftermarket poly ones. Sway bars: AKA an anti-roll or stabilizer bar is a torsion device that resists the leaning action of your ride upon taking a corner. The stiffer or stronger this bar, the less lean you will experience on said corner. This lean is often referred to as body roll and is a necessary "evil" to the street car. Without it, you would likely be in constant upset of the cars balance and be hard pressed to drive confidently fast around your average corner on the street. The sway bar responds to body roll in much the same way as your springs, but with at least one fundamental difference. If one is going straight down a road and hits a rut or bump perpendicular across the road, the sway bar offers no resistance or change in ride quality. If this bump is one wheel only, the sway bar will apply force to that wheel and attempt its return to un-loaded or neutral position. The sway bar can be seen as a compomise between softer springs for a comfortable ride and heavier springs for decreased body roll. This is a major design improvement over the traditional front sway bar of the Mustang. This has all spherical joints and eliminates the suspension bind created when the bar is put under load. This bar requires some welding to the cars frame and will add some NVH to your cars ride. See Griggs Anti-roll bar description. The rear sway bar is often replaced with a heavier one due to inhearant understeer typically found in the SN95 Mustang. I have chosen to run an adjustable rear sway bar for the ability to address understeer in very aggressive driving I do at AX events. This bar installs much differently than the stock one and begins with a "base" stiffness of 1~7 and will have 3 additional settings beyond it. Ultimately, the sway bar is really a tuning device to address understeer/oversteer conditions. As such, one bar is NOT for every situation and don't recommend one just install a heavier sway bar in the effort to improve ones handling. This should really be the final step in setting up good balance in your cars ability to take a corner. UTGQ: Universal Tire Quality Grade is a nice little guide for purchasing tires. It is by no means the be-all end-all decision maker for ones tire purchase, but offers a reasonable way to compare tires between manufacturers. Simply and generally put, the lower this rating number, the softer the tire. The softer the tire, the better dry traction. The better the dry traction, the more $$$ it will cost. Again VERY general statement, but just to help understand some fundamental differences between tires. High-performance street: These tires will be on the softer side and personally consider this to be 300 UTQG<. The lower this number, tires tend to have less tread blocks to evacuate water, so some additional care is needed in wet conditions. This will lean toward a lower profile sidewall and consider this to be 40 series or less, but completely subjective. The sidewall will also be a bit stiffer for less flex upon turning a corner and transfer more road noise in most cases. The lower the profile, the stiffer the sidewall, so consider your driving environment when choosing a lower profile tire. Last edited by Jazzer The Cat; 10-28-2011 at 05:40 AM. Haha if having your suspension set up hasn't giving you a fat head yet then i dont think there is very much that will at this point. Great info! I have been waiting for a suspension sticky from you for some time! My theory is... Power is worthless if you can't control it. Thanks a ton! Just want to throw in that PA Racing makes a K member that can be used with stock A arms, in case anyone was curious. ^ I have heard of a few companies that make a "K" member for stock "A" arms, but the stock arms are flexable and recommend one upgrade to tube arms as well. This does raise a good question reguarding the spring perches and tube arms, so I think I will update the "K" member info above. many tires are better for corners than drag as well what about them? I actually had plans to touch on tires in this thread and do so tonight, but is a HUGE subject. At some point, I will likely do another "sticky" on the subject and REALLY get into all the details of tread patters, compounds, UTQG ratings, DR's vs. twisty and such. I believe that tires are the single most important item in keeping your car on the road, next to the driver, so will put in two cents on the issue.